My first few hours playing DOOM: Boom, Jump, Huh? Doom, id Software's reboot of the classic franchise, feels equal parts retro and modern. With new gameplay additions like executions, upgrades, weapon modification, and mantling, but with no regenerating health, reloading, sprinting, or aiming down sights Doom doesn't feel outdated. A good blend of the old and the new, but will the lack of story nuance or the lack of voice acting other than gruff man mean Doom will become repetitive and unengaging? While I cannot answer that question yet, Doom is a lot of fun, and so far can easily stand next to any of the best modern shooters around. Upon starting the campaign for Doom, you get a very quick introduction, much like in the Doom of old. It is, however, done far better than in the original games, where Doom 2016 shows you what is going on, it doesn't just tell you. There is no page of text explaining the story, there is only a gruffly voiced scientist mentioning some vague things about being attacked. Doomguy starts off helpless and handcuffed to some sort of ritualistic table, after waking up he is instantly attacked. Breaking free Doomguy picks up a pistol and starts to fight, while being as dazed and confused as the player you wildly shoot at possessed scientists. It's frantic, and ever so slightly horrific, while still being over the top and the room bright enough to not actually be horrifying. The best touch of this opening section is you don't start with your power armor, helping to emphasize the frantic nature of your escape you only have a pistol and a quick trigger finger, though it isn't long before you get the armor, and a shotgun. While the execution mechanic is introduced in a ham-fisted way, forcing you to stop and "press F" to execute an enemy, the whole indoor opening section shows you the ropes and mostly allows you to use them as you see fit. Enemies are introduced by taking control away from the player, zooming in on said enemy while they make some menacing sounds. There's nothing new here, which is disappointing, but not unexpected. The enemies themselves all behave differently, where possessed scientists drag their feet like dumb zombies, possessed soldiers are more like tanks, and imps are light on their feet and jump around. Imps may not have much health, but they sure do move fast, making them harder to hit. When you get to the more open outdoor areas is when Doom’s gameplay really starts to shine, not only do you run around at ground level shooting enemies but you jump down from heights, scramble to mantle to get to higher enemies, and generally there is a much better sense of verticality. Jumping off a platform to shotgun an enemy while you drop, and landing right next to another doesn't only make you feel great, but makes you slightly more exposed. While in the air, you can't jump for obvious reasons, and you might judge your jump incorrectly putting you in a sticky situation. It's this sort of risk reward that the hand-holding of modern shooters doesn't allow for. In the opening level you get two guns, the pistol, and the combat shotgun. The pistol, while being pretty much useless, has a really good alternative fire mode. This allows the pistol to become more of a sniper, without the extreme zooming, you simply hold down secondary fire while the gun charges up to full power. At full charge the pistol finally packs a punch, allowing you to one hit imps and possessed scientists with headshots, while taking a few more hits to kill soldiers. The shotgun, on the other hand, feels powerful, at least in the early stages of Doom. It can kill most enemies with only 1 or 2 shots, rewarding you with glorious gibs, a decent kick, and a loud bang. The only time I don't like using the shotgun is when it runs out of bullets. You did read that correctly. While there is no reloading, there is an ammo counter instead. That's the case with all guns in the game, except the pistol. It forced me to think about my use of weaponry more, should I be shooting these weak enemies with the shotgun? Or shoot them with the pistol instead? You never know when you might need the shells you have saved. 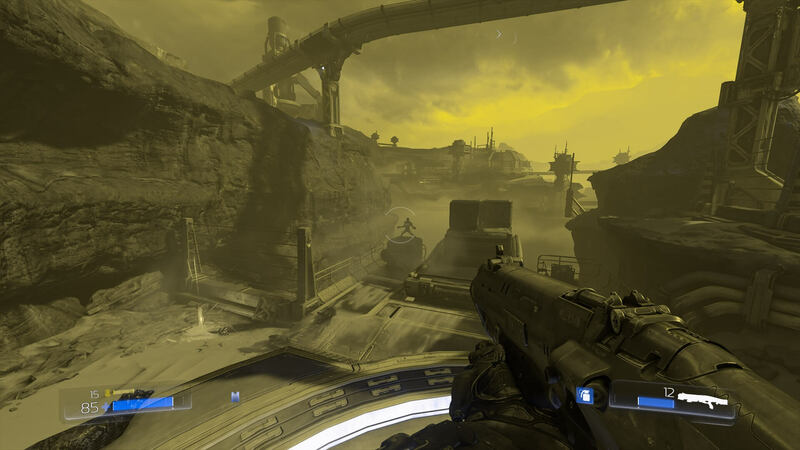 While Doom won't blow your mind graphically, it does look very good. With shadows which flicker, and disappear as lights do, to distortion effects when gas is venting, it is all very impressive. id Software have built the id Tech 6 Engine just for Doom, and it has paid off. No longer do you always get the massive pop in issues of Rage when turning quickly, and thank a cyberdemon for that because boy do you move fast. I'm not sure if you are actually floating, but with the smoothness and speed at which you move it's no wonder I'm unsure. Zipping from enemy to enemy, shotgunning them into pieces, it's all very gory and speedy stuff. Almost completely killing any enemy puts them into a daze, and allows you to execute them. This is the only way to gain health, without hunting for a health pack, of course. Executions force you, as the player, to be constantly moving and planning. Tactically shooting some enemies to get them into the execution state, and just outright killing others. As for the executions themselves, they don't overstay their welcome, looking at different parts of the body and coming in from different directions gives you different kill animations -- each being as gory and over the top as the last. My time with Doom so far can be summed up with "I cannot get enough." While writing this, all I want to do is go back and play. My only concern with the game is how sustainable the combat is, with a story which so far is very Doom -- which is to say basically pointless being there -- does the speed and joy in the combat last. Wolfenstein: The New Order was so good, in part, due to the story being so compelling. There were a few sections in that game which were more of a chore, and I'm worried that Doom won't have the story chops to back it up and make you want to push through. There is enough blood in the game, that I'm amazed the colour palette isn't just red. Doom is of course not for younger players, being very violent, but I'm having a lot of fun with it. Here's to hoping the fun can sustain itself over a longer period of time, but having multiple colorblind options gives Doom extra points in my book.